Julia: There are four of us; I am Julia López-Robertson, an Associate Professor at the University of South Carolina (U of SC). I am teaching a doctoral seminar this semester; Pedagogical Applications of Reader Response Theories. I invited the doctoral students in the seminar to join me in the blog- three of them took me up on my offer! We are quite a diverse group which will make these blogs even more fun! I asked my co-writers to introduce themselves and in what follows, you’ll get to meet them and learn a little about our team. I am a first-generation Latina who grew up in Boston and later moved to Tucson for graduate school. I was a bilingual classroom teacher for 18 years and have been at the U of SC for 13 years, wow, time has flown. Most recently I served as a judge for The Walter; an award named for Walter Dean Myers that honors his memory and his literary legacy, as well as celebrate diversity in children’s literature. I read a lot of great (and not so great) YA novels and that is how I came upon the novels we’re discussing in the blog. Priscila: My name is Priscila Medrado Costa. I am an international graduate student from Brazil currently working on my third semester in the doctoral program in Language and Literacy. I started tutoring learners of English as a foreign language (EFL) informally while I was in college more than 20 years ago. Then, I started teaching EFL formally, as my second career, in 2007, at a language school in São Paulo, Brazil. In 2012, I moved to the U.S.A. with my family to pursue a graduate certificate in Teaching English as a Second Language (TESOL) at the University of North Carolina at Charlotte (UNCC) and earned the TESOL graduate certificate and an MA Master in English from UNCC. From 2012 to 2017, I was an instructor of English as a second language (ESL) at UNCC. During all those years, I taught English to language learners from every corner of the world and had the opportunity to teach in various educational settings where there are different teaching standards and learning outcomes. What makes all those settings similar is the importance of taking the students’ needs and individual strengths into consideration before planning lessons. I have learned that it is important to raise the awareness of my students’ various cultures and to use that awareness as an asset for the students’ benefit. Cultural awareness is a crucial part of language and literacy teaching and learning. Language teachers can foster that awareness using literature in their classrooms. Through literature, we can “visit” countries and cultures that we may or may not be able to visit in real life. Classroom discussions about literature are also a way to examine our own cultural practices, beliefs, and values. In upcoming blog entries, (we) will discuss ideas for teachers to use All Stars Denied and Buried Beneath the Baobab Tree as cultural awareness tools in their classrooms. Personally, I will look at how to support English language learners in the reading of those books. Lauren: My name is Lauren Hunt. I was born and raised in a small town in South Carolina. Other than a few travel experiences, I have lived in South Carolina my entire life. I am in my eighteenth year as an educator. I earned my BA from Columbia College, and I am dual certified in early childhood and elementary education. Initially, I taught second and third grades in an elementary school in a small town in South Carolina. After teaching for a few years, I returned to school and earned an MA in Instructional Accommodation from Francis Marion University. This degree helped me learn to better meet the needs of the diverse learners within my classroom. I am also a National Board-Certified teacher. Through the NBPTS process, I learned to be more reflective in my teaching practice. I believe as an educator, I must be a lifelong learner in order to fully promote learning for my students. I recently earned my Master’s +30 with a focus in literacy. As an upper elementary school teacher, I have seen an increase in the number of students who come into my classroom without an adequate literacy foundation. This led me on a quest to find ways to help students from a variety of backgrounds to find success through literacy. I have always been an avid reader. I hope to instill in my students a love of reading so that they may enjoy books in the same way I do. In 2015, I left the classroom for a position as a Literacy Coach. It is my hope that through my work, I will not only have a positive effect on the students within one classroom, but within an entire school. My desire to help students learn to read has since led me to begin working towards my Ph.D. in Language and Literacy. As an educator, I will be looking for ways to honor all cultures and ensure students are respectfully represented through books. Asiye: I am Asiye Demir, an international graduate student from Turkey. I began a Ph.D. in Language and Literacy, and this is my first year. I earned my master’s degree from Indiana University, Bloomington in Language and Literacy. Before I came to the United States, I was a Turkish Language Arts teacher. I worked in public high schools for five years in my country. Turkey has many different features thanks to its geographical locations and historical background. Although we, as Turks, are classified as Asians, we are in a connection point of Europe and Asia. That’s why some sources call it Eurasia. Moreover, since the period before the Turkish Republic was the Ottoman Empire, which had various nationalities in its body, Turkish language and literature have various foreign components. When I began the teaching profession, I realized that I wanted to add something to my current knowledge base. So, I applied for a small-town university which was in the rural areas I was assigned as a teacher in Turkey. While I was teaching, I attended the master’s classes at that university. During my first master’s education, I focused on old Turkish proses, specifically the ones that were about criticism. Because I focused on the historical timeline of criticism, as a literary genre, in Turkey, I dealt with the old Turkish prose which made the study a little harder because old Turkish had a different alphabet than the Latin alphabet. My studies taught me the importance of having a critical lens and being in a speech-free atmosphere. Most of the texts in Turkey were published in children journals in order to not be caught by the censorship that was dominant in the country. Although we live in a diverse society, in Turkey, I do not think we manage to recognize and respect “others.” The most important reason behind this situation is the political and security concerns that occur near the borders of the country, such as the Syrian war, as well as the economic problems of the country. Hence, diverse literature experiences are left behind the daily concerns of people in Turkey. I believe that the only way to overcome this situation is by learning and teaching critical lessons through the lenses of literature. I have observed that the United States has many varying degrees of diversity in comparison to Turkey. Thus, I think that American literature is the best place to learn about the “others.” That’s why I will be particularly focusing on critical readings of the novels during our studies. Us: We come from such diverse backgrounds. 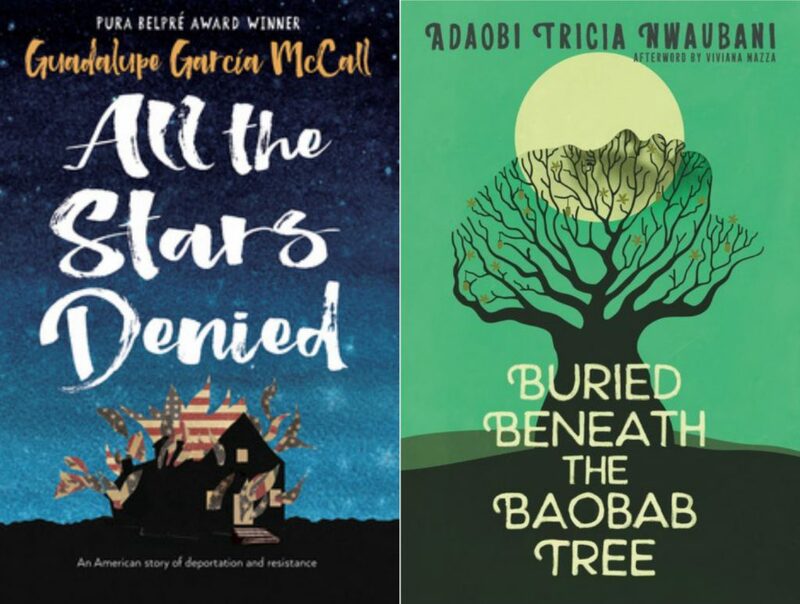 What kinds of connections and responses can four women from such distinct backgrounds have to the two YA novels, All the Stars Denied and Buried Beneath the Baobob Tree? Here’s a teaser: for a response engagement to All the Stars Denied, I asked my students to construct a playlist. We had read Artifactual Literacies: Every Object Tells a Sctory (2010) and I wanted the students to consider options for response that go beyond paper- I came up with the playlist idea to shift them from seeing response only as a written artifact. One of the songs on my playlist is from Mexican brother/sister duo Jesse & Joy; it tells the story of what happens when an undocumented family calls the fire department. Next week we’ll engage in a discussion, but for now, check out the song Un besito más and let us know what you think. Jesse & Joy. (2015). Un besito más. On Un Besito Más [Audio CD.] Mexico: Warner Music Latina. Roswell, K. & Pahl, J. (2010). Artifactual literacies: Every object tells a story. New York: Teachers College Press. Journey through Worlds of Words during our open reading hours: Monday-Friday, 9 a.m. to 5 p.m. and Saturday, 9 a.m. to 1 p.m. To view our complete listings of WOW Currents, please visit our site index. I recognize four names I see every two Saturdays, and I could not be happier to read what they intellectually scatter across the blog. This blog should be interesting, given the diverse backgrounds my classmates come from. Everyone shall enlighten us about how the stories we read in our seminar class lead us to discover who we are within our cultures. The novels and the stories we read are important, but what’s also important is how we all contribute in connecting these novels and stories across cultures and evaluate their stances from our cultural lens; the struggles, the wins, and the profound cultural upbringing that we all come from and have experienced. I look forward to reading more on what my fellow classmates have to offer. Thanks for your support Ali. This class has been so eye-opening for me. I’m happy to say I will never read books in the same way I once did. I hope my reading will be much more thoughtful and objective. I even plan to reread some of my old favorites through different lenses now using what I’ve learned through this course.